....wow! This week has flown by! It has been a good one though, so I can't complain. How has your week been? I will admit...I haven't been spending very much time at my craft desk, but that is okay. I go in spurts, but I feel the creative juices coming back to me. So, I figure I will be spending at least a little more time making some cards! I have a few cards to share with you today. 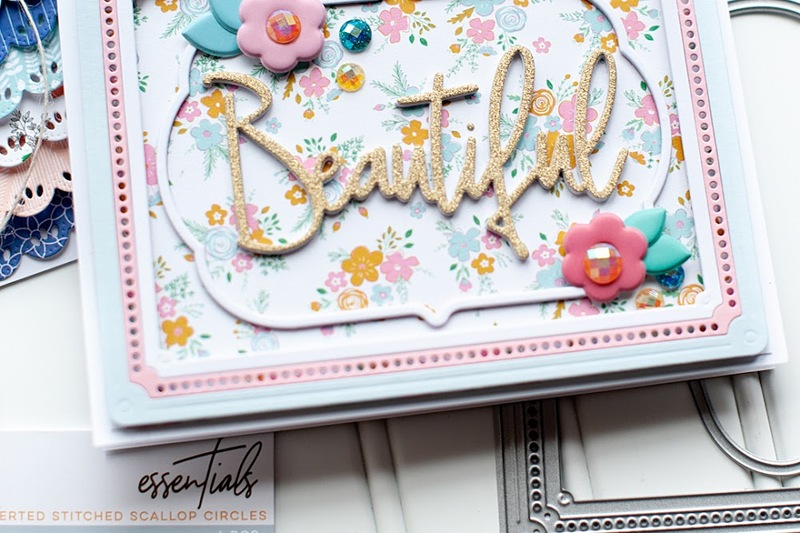 First up is my card for sketch 167 at the CPS blog this week. Decided to break out some fabulous Webster's paper, and a CTMH stamp set that I have had forever. The two just seemed to go together so well! Instructions: Fold cardstock in half to make card base. Zig-zag stitch a rectangle shape that is 1/4 inch smaller than the red dotted paper block. Adhere the floral paper block over top of the stitching so just some of it peeks out, and then adhere brads to each corner. Stamp the butterflies to the white space on the floral paper block, and then stamp the sentiment over top of that. Cut the banner from patterned paper and adhere to the upper right corner. Accent the banner and the smaller butterfly with small pearls. 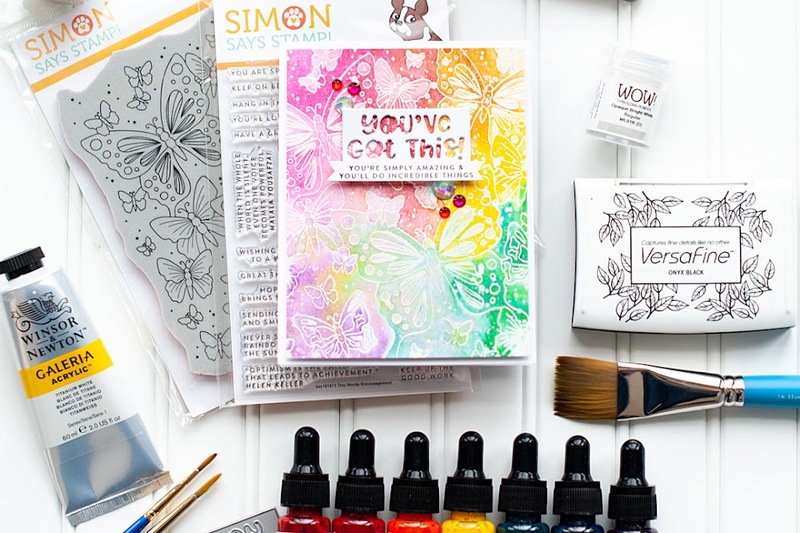 Adhere the entire paper block to the front of the card base, and then glitter the floral paper using Stickles. 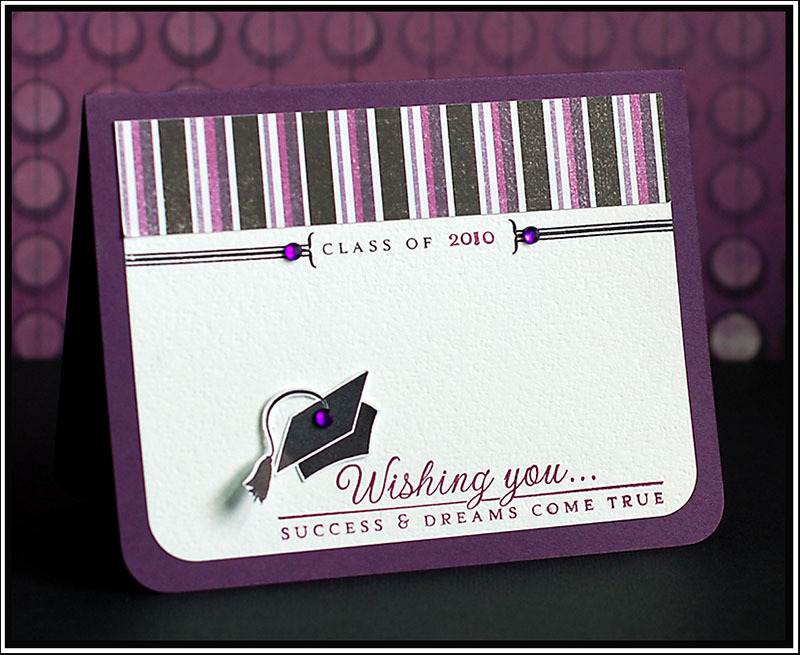 Up next is a graduation card using sketch 90 from the Clean & Simple Stamping blog. Yes- my second time using it. I love it! And, it was perfect for this....because I need to make quite a few of these cards for the kids that I photographed this year, and some of Casey's friends. Instructions: Fold purple cardstock in half to make card base, and round the bottom corners. Round the bottom corners of a white cardstock block, and adhere a striped paper strip to the top of it. Stamp the border directly below the striped paper, and the sentiment to the lower right corner. Adhere the entire block to the front of the card, and accent the border with purple jewels. Stamp the cap to white cardstock and cut out. Adhere to the front and accent with a purple jewel. And just one more card to share with you today...and it is super clean and simple. But, I love it! 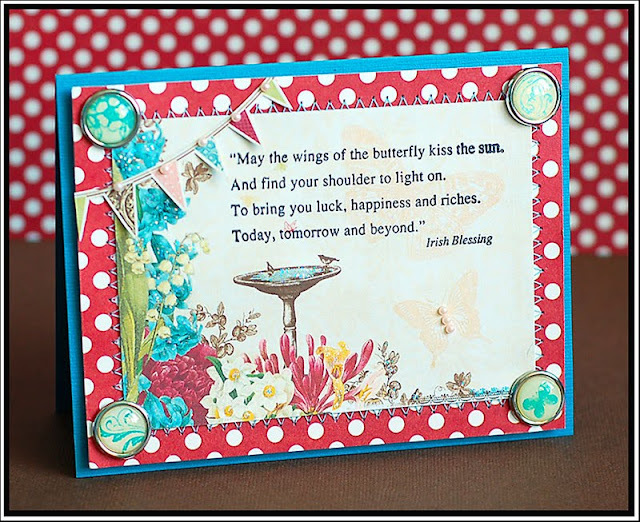 The challenge gallery this week at the Cards Magazine Blog is to use berries...and this is what I came up with! Instructions: Fold white cardstock in half to make card base, and punch a bracket border to the card front bottom. Add the three brads in a row to the front of the card. Adhere the letter stickers directly below the berry brads. Add the rub-on sentiment below the letter stickers. Finish by adding brackets to each side of the cluster. 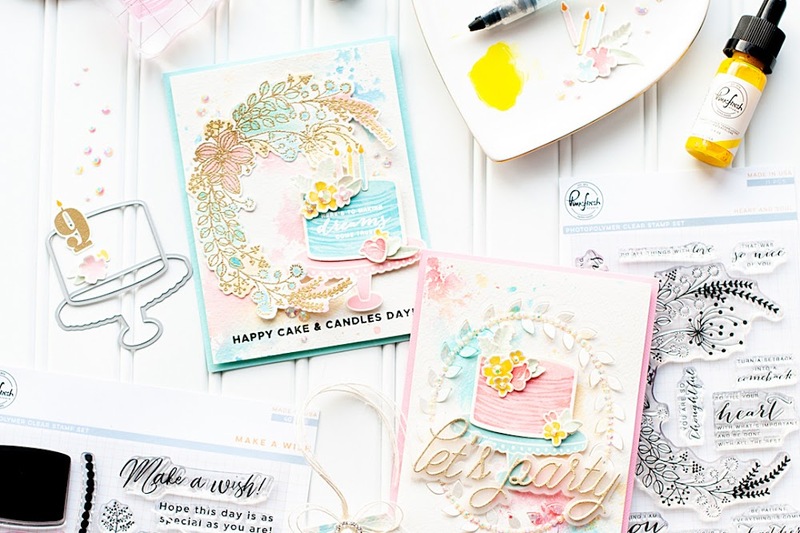 Those are all the cards I have to share with you today...but have you been checking out the Glitz Blog at all this week? Well, we have started the new design team posts this week, and I have to say...the designers are doing an amazing job so far! 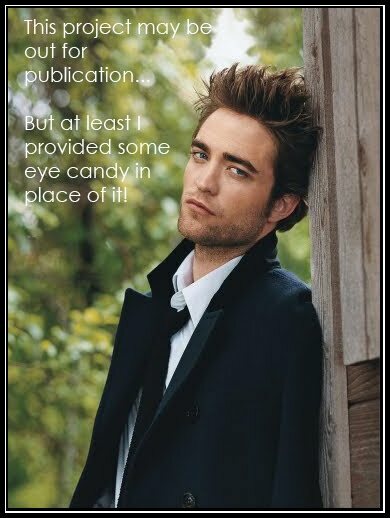 Of course, I get an earlier peek than everyone else because I post everything to the blog....and I have to say that it is an awesome perk of the job!! Be sure to head over and check it out if you haven't...the girls are doing so awesome! P.S. : Thanks for all the comments on my last post, with Casey's graduation announcement. And just to let you know...he is actually my brother, not my son. I sure hope I don't look old enough to have a 19 year old kid! Tee hee! What lovely lovely cards Lea! Your cards are fabulous! All of them! Lea, your cards are so lovely and beautiful!! I love your style and the way you use the colors! As usual, you do not disappoint. These cards are beautiful, Lea. I esp love the Berry card - so yummy with all the bling. You can do it all, girlfriend! Clean & Simple or packed full of goodness....your cards always amaze me! Gotta say, I love those little strawberries and cherry! I LOVE that graduation card! Just beautiful. Love the colors. Great job with everything! Love these cards, Lea!! You make clean & simple look AMAZING!!! And no, you don't look nearly old enough to have a 19 yr old! You're just a "baby" yourself! lol!! Super cute cards, Lea! I especially LOVE the berry one!!! Be still my heart - I LOVE it!! These are all gorgeous, my fave is the graduation card. These are pure perfection Lea! I absolutely love the simplicity of that berry birthday card!